It’s all here in black and white. 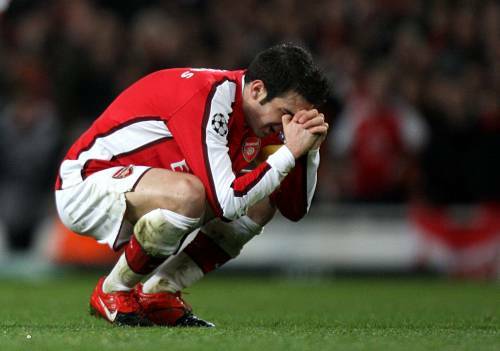 Arsenal skipper ‘Cesc Fabregas is almost 100% definitely going to be a Barcelona player next season. According to that last bastion of truth in a world split asunder by lies, El Mundo Deportivo (which is, by complete coincidence, published in Barcelona), the Gunner’s midfielder has confided in his ‘family and friends’ that he has agreed a four-year deal with Barca, and the only thing standing in the way of his move to the Camp Nou is that both teams cannot agree on a suitable compensation package. The Spanish rag goes on to speculate that a fee of €40 million has been agreed between the two club’s and, in addition, Arsenal look set to secure Yaya Toure in part-exchange for Fabregas. However, the Ivorian midfielder’s exorbitant wage demands are the only sticking point that is keeping the deal from going through. Spread this news: Lionel Messi is confirmed to transfer to Arsenal. He shared this with his family and friends and he’s very excited about living and playing in London. The stats make for dismal reading as far as Arsenal are concerned. Feb is our top score at 15 goals from 27 games followed by RVP 9 goals 16 games.Maybe feb could have scored another ten and RVP also ten gaols if they had played more matches. Ashvinngot 10 from 30 matches. Chelsea were champs because they had four players who were each into double figures. In contrast Arsenal 2nd tier players fared badly. if the gunners are serious about winning the title,they shd ahve at least three to five players scoring consistently. Btw benedtner and Ashvin were playing as wingers at times. I hope Arsene will get Pires/Overmars type winger. Arshavin want to play in Barca too. So it’s better to sell him. See the video clip?…Where he says he will only leave Arsenal for Barca?…And that he wants it sorted prior to the WC?